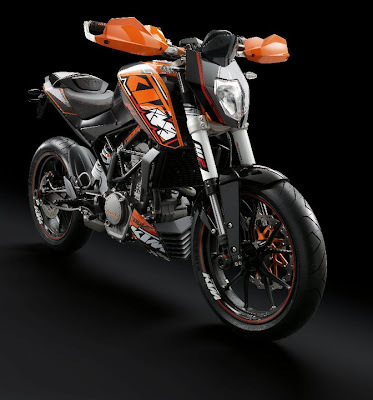 KTM Sportmotorcycle AG is an Austrian motorcycle manufacturer brand, has recently unveiled the Specification and features details of its new KTM Duke 125 bike. The company has already announced that it will launch the new entry-level premium bike soon in India. KTM has associated with Indian arm, Bajaj Auto. 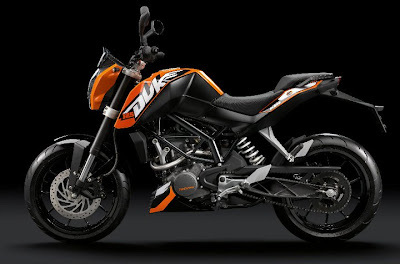 The company now finally disclosed the details like components and technical features of its new Duke 125. As per some news reports, KTM will launch the new Ktm 125Duke in the European market by March 2011 and the Indian buyers will get it late of 2011. The powertrain of this bike has been loaded features with Liquid cooled engine, Fuel Injection, 4 Valves-DOHC, which can expect to offer excellent output of power and torque. It might be delivered superb mileage in the Indian streets along with top speed of around 140 kmph. The gear box of Ktm Duke 125 would be packed with 5 speed transmission system. Other features like185 mm Ground clearance, Chunky Swingarm, 150 mm Rear Tyre, 43 mm dia USD (Upside Down) Front Forks, Trellis Frame, Hydraulically Operated Clutch to make it more comfy and safety. KTM is developing the new Ktm Duke 125 jointly with Bajaj Auto. The new Duke 125 might get hefty price tag in the premium two-wheeler segment. It might also be got tough competition with Hero Honda Hunk, Bajaj Pulsar, Honda Dazzler, TVS Apache and Suzuki GS150R. The wheels of Duke 125 is equipped with alloy wheels and dual muffler exhaust. Indian major two-wheeler players are looking for globalize their two-wheeler associated with global two-wheeler majors. Presently, Bajaj Auto has tied-up with two major two-wheeler maker, Kawasaki and KTM. Bajaj had already launched Kawasaki Ninja 250R in the Indian auto market with Kawasaki joint venture. The company is now looking forward to launch new Ktm Duke 125 jointly with KTM motorcycles in the country.